Government Says It's On Track To Reunite Migrant Parents And Children By Deadline As of Thursday morning officials reported 711 children had yet to be reunited with their parents or an approved sponsor. Some 1,800 children have been handed over to their parents or sponsors. 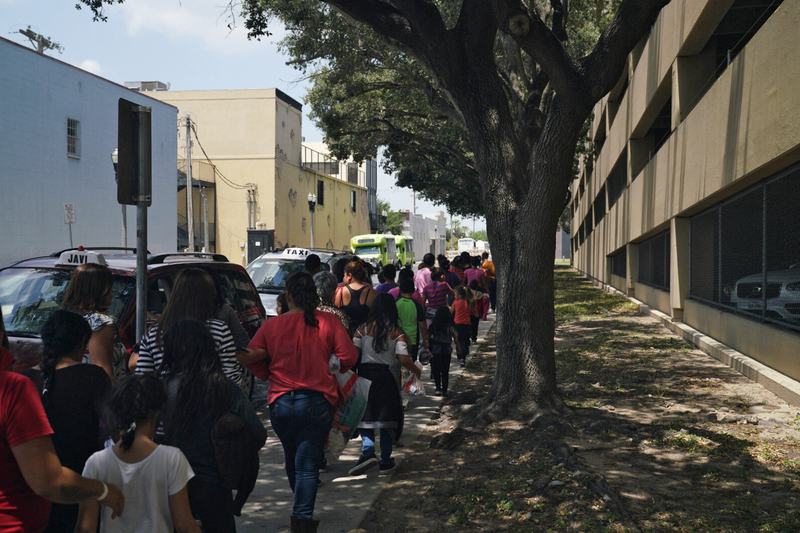 Women and children walk to a bus in McAllen, Texas. People released from immigration detention centers are often dropped off at the McAllen bus station nearby. Of those, 1442 have been reunited with parents being held by U.S. Immigration and Customs Enforcement in two detention centers. The remaining 378 have either reached the age of 18 or are living outside a detention center in the U.S. with their parents, relatives or another adult approved by the Office of Refugee Resettlement, which as been overseeing the minors' care. But as of the morning count, 711 children were still in ORR custody because their parents are either already out of the country, considered ineligible for reunification, or have waived their rights to their children. Chris Meekins, chief of staff for the Department of Health and Human Services Assistant Secretary for Preparedness and Response, said in press conference that, "Hundreds of staff within HHS have worked 24-7 to reunify children with their parents in ICE custody." Officials revised the total number of children who have been separated from their parents upon entering the U.S. from 2,551 to 2,531, noting that number includes children who were taken into ORR custody before the Trump administration's "zero tolerance"policy went into effect.